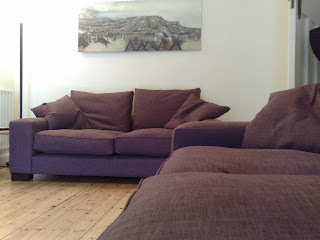 Today marked another small step for number 13 as the long-awaited sofas arrived. We ordered them in late july and it really is nice to finally be lounging about on one. The delivery guys were a well matched pair. One said nothing the entire time whilst the other talked constantly, providing a running commentary on whatever he was doing ("I'll remove the packing now by cutting through the bottom - never the top, mind. I'm not using a safety knife as I don't get on with those..."). Blogged from my phone, lying on the sofa just because I can.